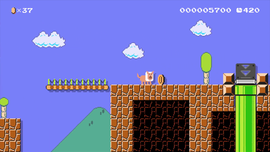 Walkin' with Undodog (known as Walkies with Undodog in PAL regions) is an Event Course in Super Mario Maker, released on November 25, 2016. It unlocks the Undodog Mystery Mushroom costume upon completion. The level begins with an office-esque setting, similar to Mary O's Lunch Break. It leads to a warp pipe, which in turn leads to an underwater section with Piranha Plants and winged Munchers. After another segment with Koopa Troopas led by trampolines, another warp pipe appears, leading the player to a brief jumping segment before the next warp pipe. Mario must then swim past a brief segment with Spinies, along with a long segment containing Thwomps and Chain Chomps before reaching yet another warp pipe, being led directly to the Goal Pole. This page was last edited on November 15, 2018, at 17:07.